oily hair - Excess oil on the hair makes terliha limp. How Caring and Coping with Oily Hair - Many of the problems faced by women by the hair. One annoying problem for women is the problem of oily hair. Easy to stick dirt, look flat and sometimes cause unpleasant odors are a common feature of greasy hair problem. If frequently cleaned or washed, then the natural hair moisture will be lost. 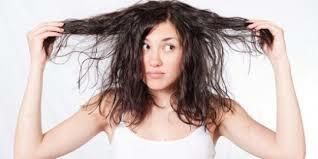 Besides too frequent hair washing will also damage the hair and nutrient loss. Day activities that require you to be in the sun will exacerbate the problem of oily hair. All kinds of dirt will easily perch and often causes hair loss. For those of you who wear the hijab, the course should give more attention to the issue of this one. Do not let the hair greasy disrupt daily activities because of the discomfort it causes. Here are some tips on caring for oily hair that you can do yourself at home. Each type of scalp has its own shampoo away. As in oily hair should use a special shampoo greasy hair so that no one nutrient. If necessary use a baby shampoo. Although the weather was cold, and you use warm water for bathing, never use warm water to wash your hair. Use of water in temperate or cold water to wash it. Warm water can damage the hair if used continuously. Make hair washing 3 times in a week. Make sure each strand clean, and do not get too focused on the scalp. Rinse each strand of your hair so that dirt and dust off can be lost by shampooing. Use conditioner on each strand and not on the scalp. Use of the gel will only worsen the state of the hair. Avoid its use so that the hair does not look even limp. Let your hair naturally only. Moreover, the use of gel will stimulate the emergence of more and more oil and will cause itching. Combing is the usual thing to do if hair was messy and unruly. But too often combing will not be good. The teeth of a comb on the scalp will actually make the scalp more oily, besides loss will also increase. For treatment, you can try using lemon juice and vinegar in a ratio of 4: 1. Rinse the hair with water after shampooing, but not until on the scalp. If too much on the scalp, then it will feel itchy and sore. Water or henna henna leaves is known to have the ability to absorb the oil on the scalp. It's easy, it is only by attenuating or crushed henna leaves this water until soft. After that, apply evenly on the scalp. Allow a few moments until the leaves work. After that, rinse with clean water. Quite performed two times in one month. Aloe vera is no stranger to the world of beauty, including to address the problems of hair. The trick peeled aloe vera to clean, remove mucus and leaving the gel alone. Use aloe vera gel when applied to the scalp. Allow a few moments, then rinse thoroughly. How to use egg whites to deal with the excess oil on the hair. The trick, mix the egg whites with 2 tablespoons mint leaves that has been refined. Spread mixture into all parts of the hair and leave for about 30 minutes. Afterwards, rinse thoroughly. Use shampoo to eliminate the fishy smell of eggs. For those who like to cook or are often located in the kitchen must already know what it cornstarch. But not all of them know that this flour can be used to overcome the problem of oily hair. The trick, mix 1 tablespoon cornstarch, 1 tablespoon of warm water and a few drops of lemon juice. Apply the mixture on the hair evenly. Let stand for 20 minutes, then rinse with water until clean. Well, that's some tips on how to cope with greasy hair. Please choose which one you think is easiest to do. Do not forget to do on a regular basis in order to maximize results and quickly visible.